Triptolide has been widely reported to exhibit potential therapeutic value in multiple inflammatory diseases, such as rheumatoid arthritis, systemic lupus erythematosus, and psoriasis. Although its safety and efficacy as an anti-inflammatory agent have been verified by many studies, the effect of triptolide on osteoarthritis (OA) was not clearly understood. In this study, we found that triptolide prevented OA development in a surgical destabilization of the medial meniscus (DMM) mouse model. 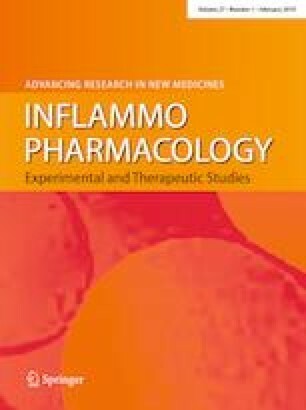 In addition, triptolide inhibited both DMM-induced and LPS-induced expression of pro-inflammatory cytokines in the human monocytic cell line THP-1. Further mechanistic studies showed that the reduction of pro-inflammatory cytokines by triptolide was mediated by the upregulation of nucleotide-binding oligomerization domain-like receptor family pyrin domain-containing protein 3 (NLRP3) and downregulation of caspase-1. Finally, we identified that hsa-miR-20b, a microRNA targeting the NLRP3 gene, was downregulated by triptolide. This study provides a novel insight into the effect on triptolide in preventing OA pathogenesis. The online version of this article ( https://doi.org/10.1007/s10787-018-0509-6) contains supplementary material, which is available to authorized users.